So you’re crazy enough to want to forge your own real sword, and it's got to be a gladius. Recreating the ancient Roman legionary’s classic blade is possible, even for a beginner, but it does requires a steep learning curve. You need to do your historical research, and you must approach the whole craft of sword-making with great care and humility. Choose your gladius blade design. Your choice will determine how easy or difficult your project will be. The Roman gladius blade was based on a preexisting blade design historians call the Gladius Hispaniensis, which the Romans encountered during their conquest of the Iberian peninsula in the early days of the empire. They subsequently borrowed and improved on the design, producing the Roman gladius blade. The gladius came in three patterns, which sword makers today call the Mainz, the Pompeii, and the Fulham. The Imperial Roman Twentieth Legion, a re-enactment society from Washington D.C., has diagrams of all four blades on their website, which you can download as a guide. The Pompeii is the easiest to produce because it’s just a straight blade, the shortest of all, while the Hispaniensis has the longest blade. Meanwhile, the Mainz and Fulham have silhouettes closer to a “leaf” blade, tapering in the middle, and flaring slightly near the hilt and angular point. If you have experience in forging and welding before, and have all the right equipment, go prepare a billet of steel. Grind the edges of the steel bars until they’re smooth. Then stack them together tightly using a vice, wrapping the stack tightly with wire in sections. Heat the stack at the forge and weld the bars together to form the billet. This billet should be in the thickness of your intended gladius, but at a length and width larger. Work out the raw shape of the gladius by heating the billet in sections, taking out the section wires as you go. Do not heat the entire billet’s length at once, or it will be difficult to control. Do not attempt to create a perfect gladius shape in the beginning; you can achieve that later in the grinding phase. If you want a stronger blade, American blacksmith Fennis Forge’s site gives a few clues on how to build a Damascus steel billet. In involves re-cutting, re-stacking and re-welding the billet until you arrive at a highly-layered length of steel. If you’re a beginner, simply skip this part and purchase a billet or length of steel to your specifications from a hardware store or metal supplier. Using chalk and a scriber or felt tip marker, draw the basic outline of your blade’s full design onto the finished billet. Make sure you draw the right dimensions, based on the Imperial Roman Twentieth Legion’s diagrams. 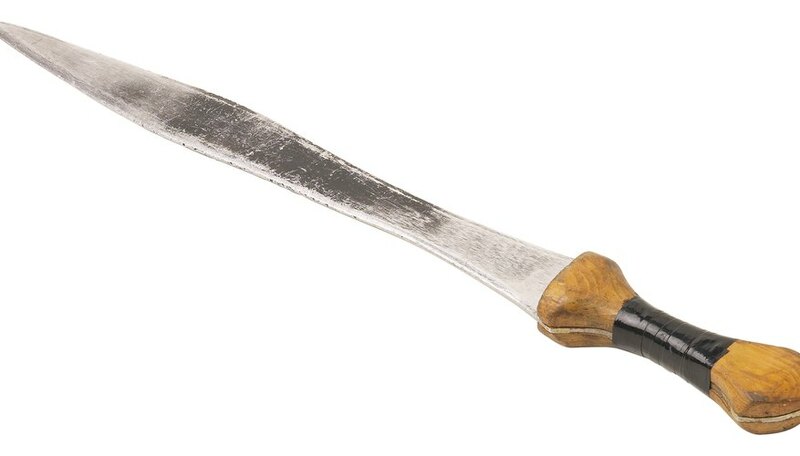 For instance, the Fulham gladius blade is 21 inches long, and 2 inches wide, with a pointed edge that was a third of the blade’s length, 7 inches. Don’t forget to draw the tang of blade as well. You need to form the tang, as it will be the backbone of the gladius sword’s grip. The Twentieth Legion suggests a gladius blade’s tang should be at least 9 inches long, and about 1/4-inch wide. “Cut” out the shape of your entire sword using the angle grinder. This method of creating the blade’s final shape is called “stock removal”. First, drill out any tight corners in the outline that your grinder might not be able to reach. Note, however, this step might be unnecessary to your design, since gladius blades are straight enough to be made with a grinder. Use the grinder to cut along the outline you drew, just a hair’s breadth away from the outline, instead of directly on it. After freeing the blade’s entire shape from the billet, use the grinder to refine the blade and cut on the outline this time. Mark out the facets of the gladius blade’s which form the center line or bevel. Then carefully grind it into the blade, going down through the entire length of the blade with each stroke. You don’t have to get the blade perfectly sharp and smooth at this point. You can use a belt sander afterward, to smooth away rough aspects of your work. Finally, strengthen the blade by heat-treating it. This must be done by heating the entire blade evenly, instead of heating it in sections. If you have your own forge and have some experience, go ahead and do this yourself. If you’re a beginner, do not attempt the heat treatment yourself. Instead, have a blacksmith do this for you. After heat treatment, the blade will look “dirty” and dull. Create a brighter finish by sanding down and polishing the blade. Complete the sword by creating the hilt (with its guard, handle, and pommel). The Imperial Roman Twentieth Legion site also gives details on how a finished gladius ought to look. Have respect for the blacksmith and sword-maker’s art, and learn their time-honored techniques and proper safety procedures. If you’re a beginner, do your research thoroughly and attend blacksmith workshops; do not attempt things on your own without such training. You could hurt yourself or a loved one in a forging accident. Michael Long is a practicing nutritionist and started writing in 2010 for various websites, covering topics in alternative healing and nutrition. He has a master's degree in nutrition from Benedictine University.